My '07 (bought new in 10/'06) had 90K miles and has been thru 8.5 NW winters. They don't salt like back east but do put down deicer. - NOTE: Supposedly there's an 8 year / 80K mile warranty on exhaust (emission?) parts. Check w/the dealer if yours is inside these #'s. - I did NOT bother going to the local Toyota dealer as I was past the 8/80 warranty period. - Disappointed w/the quality as I have 3 OLDER Subarus and their stock exhausts are still functional>>NO holes/rusting/etc. Part #: Walker 54721 - Fits 2006-2010, RAV4 w/the 3.5L V6. My story: - Muffler came from warehouse back east, which was delayed a day by the weather (don't blame A for that). - It was shipped withOUT a box. They (A or Walker?) just put a sticker on it and shipped it FedEx. The muffler was dented and the ends were bent. @ least the ends were covered w/plastic so I didn't have to drain out bugs, water, road kill. The damage was minimal and was cosmetic as far as I could tell. - I measured 3-4x and cut the stock pipe once w/a Sawzall / reciprocating saw - easy peachy- (I cut mine off about 8.5" out from the muffler on the INside of the pipe bend)...The Enlarged end on the front looks like it's designed to fit OVER the stock pipe - once the stock pipe is cut. Mine did NOT- Even after 'modifying' the end by flaring it a bit. (Looking @ the Walker part you can see the pipe's diameter is SMALLER than the stock pipe's where it comes out of the muffler. )The stock pipe was 2.42" OD and the new muffler's pipe was 2.5" OD, which doesn't tell the ID of the new pipe, but gives an idea. Luckily I had a 2.5" coupler connector, and an extra pipe clamp. - When initially checking the fit of the new muffler with the stock rubber exhaust hangers (ensure you spray them w/WD-40 to make getting them onf/off MUCH easier), the muffler rubbed the exhaust heat shield 'pad' between the body of the RAV and the muffler. I bent the two front rods/hooks UP to move the muffler DOWN. No more rubbing. - The rear of the stock muffler's pipe has a exhaust 'donut' gasket that seals the rear of the muffler's pipe to the rear 'axle-back' by two bolts and springs. I carefully removed the gasket (it looks like it's part of the pipe, but light pressure w/a flat-head screwdriver on the INside of the gasket will loosen it as you work around the edge) and installed it on the new pipe. However, I was 'screwed' again as the stock pipe has the NUTS welded to the flange. Walker's version DOES NOT. Again, I was able to find two M10x1.5 nuts in my stash that fit so I could connect the new muffler pipe to the axle-back section of the stock exhaust. - Hooked up the hangers and Tightened the two pipe clamps on the front; tightened the two bolts and nuts on the rear flange. Started it up and no more neighbor-waking noises. Exhaust leak on a Toyota @ less than 100K miles? And not in the northeast/midwest 'rust belt'? Not acceptable. I am shocked that the muffler/exhaust system is so badly rusted as I keep the car in the garage. I think it is a major flaw for Toyota RAV4's as I've taken notice of others parked on street and their mufflers are also rusted! I look at Honda's, Ford's, etc and they all have a much stronger material for their mufflers. 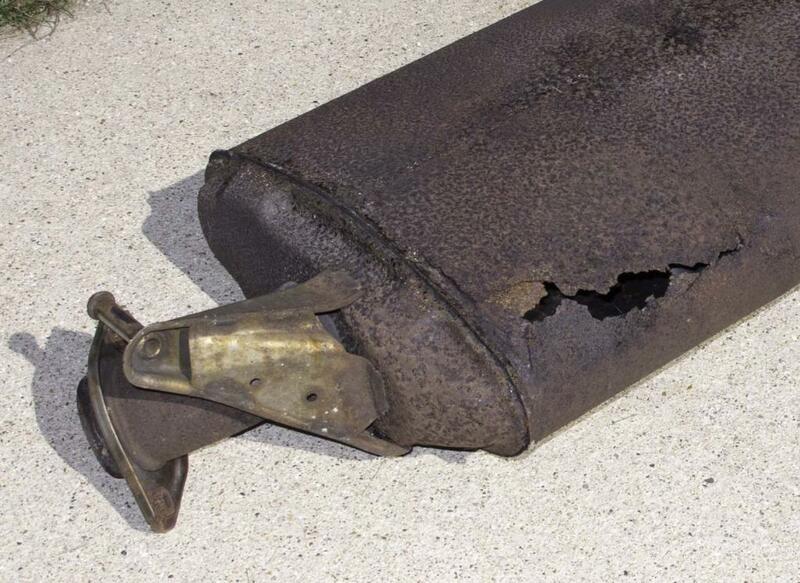 I think there should be a recall for the 2007 Toyota RAV 4 muffler/exhaust system. I have been a loyal Toyota customer over the years, purchasing five models, most of them brand new. But now we are faced with a $1500 repair bill to fix the exhaust system on a vehicle only 6 model years old, with only 61,000 miles on it. Because it is an emissions problem, and my state has annual inspections, this has to be taken care of right now to keep the vehicle on the road. I find that it is not covered by the 8 yr / 80,000 mile emissions system warranty. This situation is unacceptable, and my next vehicle will probably not be a Toyota. My muffler rusted out a hole and the car runs very loud now. I can't replace the muffler because its apparently connected to other exhaust components that have to be replaced with it, which cost over $1,500. Dealership is saying this is not part of the 8yr/80k emissions warranty, yet everyone online with a Rav4 is saying they got there's fixed under that exact warranty. Who do I contact at Toyota USA to get this addressed?!?! So far my Toyota dealership is saying that is is not covered under the emissions warranty because it is not connected to the converter (pictures prove otherwise). This was after I called the Toyota company in Torrance, CA. 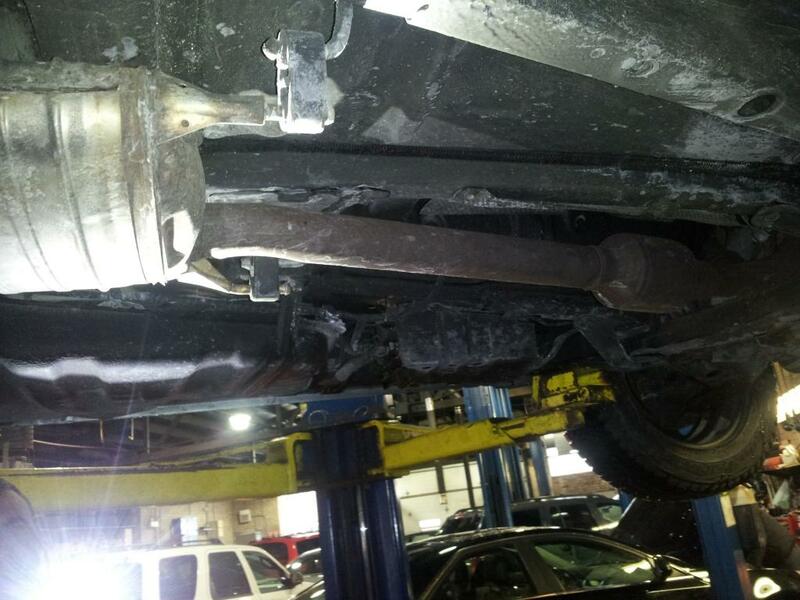 The spokesperson there said that is should be covered under the 8/80 warranty if there are no flanges connecting the muffler to the converter and that they sent over some information about this to the dealership. I contacted the dealership the next day and they were still saying it is not covered giving me a confusing explanation. I recently emailed the service manager about this issue so he can personally see to this issue. There no way my muffler for a 2007 RAV4 is going to rust out before my 1998 Corolla which is still working fine and have to pay more than 1300 to fix it..
$1300 for a center pipe??? How can that be? This thing shouldn't have a hole in it after only 5 years! This will be my last Toyota at these rates! Maybe it's time to test Hyundai's warranty? In sept 2011 we bought a 2007 rav 4 limited edition from a Toyota dealer as we figured it has undergone all inspections and would have all necessary warranties. Well in July I brought it to the dealer for an oil change only to find out that the muffler was corroded and the cost after labor and taxes would be around $1500 as the muffler is a long pipe connected to the catalytic converter - this is how the car was built was my answer -. Upset I was appalled by the fact that a 4 yr old vehicle had muffler corrosion when my prior car (1999 Honda civic) that we gave up for the purchase of this Toyota in 2011 never once did I change the muffler yet a 4 yr old car needed a muffler change. After complaining to the dealer they told this cannot pass under the 8 yr/130 km warranty (to which I had no idea we had this type of warranty) cause nothing was wrong with the converter or an engine light was not on. Tks to this site I got my problem resolved. Took 2 months but worth it. converter, but your warranty on the converter is still only good for 4 to 5 years. I just can't believe all the parts that are failing on this vehicle. I'm not going back to Toyota for my next vehicle! Update from Jul 17, 2011: Toyota dealer and Toyota Canada say the muffler is not part of the emissions system and thus not covered under the emissions warranty. 4 years old, low mileage, poor quality. I had a similar prob to the the others with the rusted exhaust system. The dealer wanted $1700 to repair it but thanks to this web site I pushed the dealer and finally they conceded that it was covered under the 8 year 80000 mile warranty. Thanks so much to the site!!!!!!! Premature Exhaust System Failure: My 2007 RAV4 muffler has a hole in the top rear passenger side after only 4 years and 46K miles. This has not happened before for other Toyota or Subaru vehicles that I had with SS exhaust systems. Based on other comments this is not an isolated incident. I agree with those that this is a manufacture's defect by Toyota's supplier(s). Poor stainless steel material seems to be the problem. There has not been any recall or negotiated settlement with customers from what I have seen so far. Has there been a class action started for this issue? SS exhaust systems should last well over 100K or 10 years. Tomorrow I plan to discuss with the service manager at our local Toyota dealer. I suspect I will not get a satisfactory response but this would be my first attempt to see if Toyota will help rectify the problem. They deserve at least that from me. Update from Oct 14, 2011: My premature muffler failure has been resolved by Toyota; but, before I say any more I want to take you back to the beginning of my dilemma. Bear with me through this saga because it is worthwhile noting the results and how I got there: Initial Complaint: Premature Exhaust System Failure: My 2007 RAV4 muffler has a hole in the top rear passenger side after only 4 years and 46K miles. This has not happened before for other Toyota or Subaru vehicles that I had with SS exhaust systems. Based on other comments this is not an isolated incident. I agree with those that this is a manufacture's defect by Toyota's supplier(s). Poor stainless steel material seems to be the problem. There has not been any recall or negotiated settlement with customers from what I have seen so far. Has there been a class action started for this issue? SS exhaust systems should last well over 100K or 10 years. Tomorrow I plan to discuss with the service manager at our local Toyota dealer. I suspect I will not get a satisfactory response but this would be my first attempt to see if Toyota will help rectify the problem. They deserve at least that from me. Initial Result: I took it in to my local dealer who did the inspection. They said, sorry, but this vehicle is out of warranty and you will have to pay $1,679 plus tax for us to replace it! That did not seem right to me so I took the holy gapping rusty muffler with me for latter action by me. I could not drive it this way because tickets cost too much, so I had to go to Midas to replace it – just the muffler, not the rest of the rusting but not yet holy exhaust system - for an unreasonable $400 but what could I do? First Action Taken: Upon receiving my Midas muffler repair that rattled after installation when I took left turns, I called the USA Toyota main office in Torrance, California to ask what can be done about poor materials and premature failure for their RAV4 stainless steel mufflers. They said nothing could be done since my car is out of warranty, they suggested I call the dealer customer service to see what they could do. I did as they said and the customer service manager verify that they really could not do anything for me even after he had done the same thing I had by calling the Torrance, CA. So that is it…you’re stuck… but no, continue on: Second Action Taken: It took a while to get my ducks in order, but the next step was to write a letter to 3 different identities with color photos showing my failed muffler: • Dealership Owner • President USA Toyota, Torrance, CA • President Toyota Manufacturing Corp, Tokyo, Japan Resolution: About a month later I got a call from the Torrance office. They said they were very sorry for the mix-up, but that this failure is supposed to have been covered under the emission control warranty since the muffler is directly connected to the catalytic converter without any flange between. The emission control warranty continues for 8 years or 80,000 miles. They said they would reimburse me for the Midas muffler and provide me with a new exhaust system at no charge. Today, after much consternation, time and effort this problem has been completely resolved…almost. The new system has identical construction (weld seams, etc.) as the old one. The muffler, pipe and catalytic converter are strongly attracted to my magnetic – certain stainless steels are attracted to magnets, so I have no way to verify that it is truly stainless steel or quality stainless steel. This may happen all over again 47,000 miles or 4 years from now if this “stainless steel” exhaust system fails in the same manner; but, this time with an expired emission control warranty it will be on my tab at $1,679 plus tax, plus escalation! I wish Toyota can assure me that I do not have the same materials I had previously; but, if this unfortunate saga happens again I will need to pursue another resolution based on an extended warranty as another premature failure should definitely not occur after receiving a new stainless steel system at (now) 49,000 miles. 2007 Toyota Rav4 base model V6 engine. Three and a half years and my stainless steel exhaust system is rotted out. Vehicle is too new to get aftermarket parts.Midas,Monroe and Meinike can't get the part except from a toyota dealer. 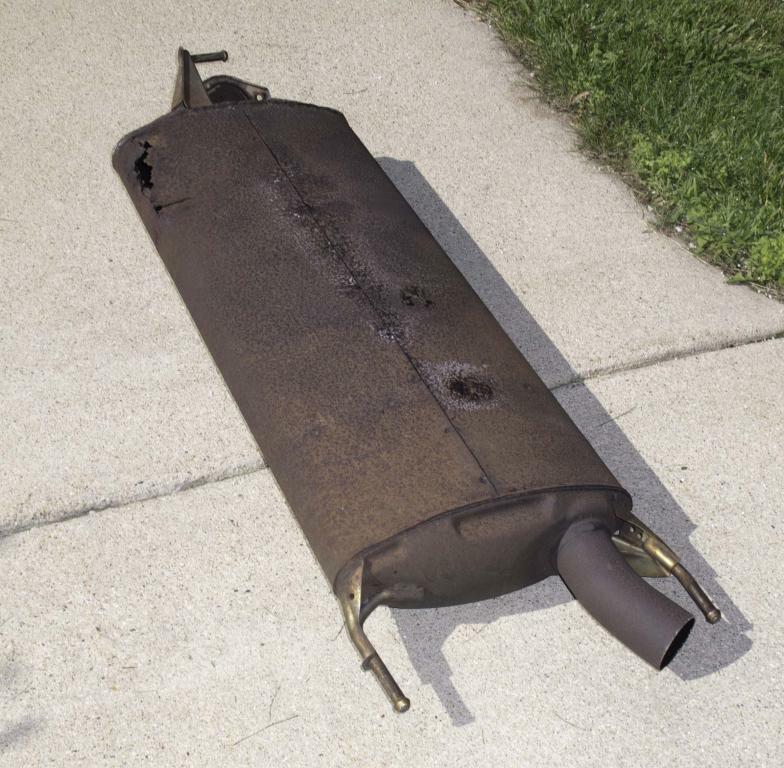 Dealer quoted parts cost: Muffler - $1,230.00. Gasket - $39.15. Gasket - 69.60. That's $1,386.38 including CT sales tax. Labor not included. That is way too much to replace a three and a half year old muffler. I switched from owning Jeeps to Toyota because Consumer Reports rated the quality and longevity very high. What a mistake. Also, 3 out of 4 air pressure sensors have had to be replaced. My wife needs a car this year - guess what? We are comming back to owning Jeeps made in America & Canada. Hole on top of muffler. Had to patch it.Replacement too $$$. Will see how it lasts! I purchased this vehicle new and the exhaust issue is the latest problem for this vehicle. Estimated cost of repairs was listed @ $1,440. I am reserving any final comment as the dealership is working with Toyota to see if they will reslove this problem. This site while confirming just 2 issues thus far validates my concern for potential quality issues. I was told there was no aftermarket muffler available. I will follow through on the suggestions from this board if the Manufacturer refuses to replace. With these vehicles no entering their 4 & 5th year it will be interesting to see if there is an increase in instances with this issue. I was told that the stainless steel muffler on the RAV4 would last for at least 10 years .... but it didn't!! The Midas outlet I took it to was very good and very surprised but could not source a muffler from Toyota only the whole exhaust system for $1100. Add on the labour cost and to say the least, I am not happy. I really don't want to increase Toyota's profits, so I will have a non Toyota muffler installed like the other RAV4 drivers who have been caught . I really don't understand why Toyota does not stand behind their claims on the exhaust system or even sell a replacement muffler... just too greedy I think!! If the muffler and catalitic converter are a single component then the muffler failure is covered under the 8 year 80000 mile emissions warranty. Dealer replaced mine last week. If your dealer didn't know this you should contact Toyota and ask for compensation. I have a 2007 Toyota Rav4 with 38,000 miles and the muffler rusted through on the top very close to the back of the muffler. This appears to be a very strange area to rust through. 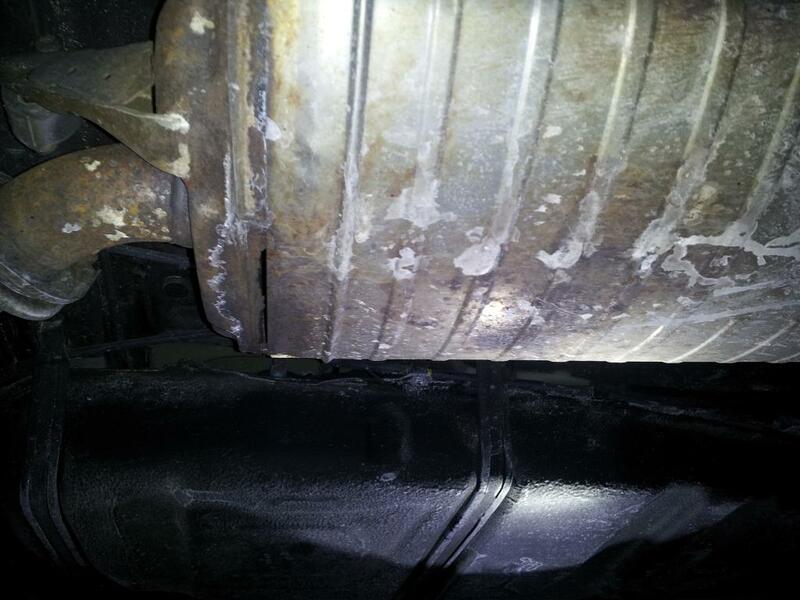 The rest of the exhaust system is in good shape and is not rusted. This is either an engineering problem or a defective part that is going to cost $1200 because some Toyota engineer decided to put the catalytic converter in the defective muffler. I have a 36 month (36,000 mile) bumper to bumper warranty and a 60,000 mile drive train warranty. I bought the car new in December of 2006 and I have owned it for 48 months, so no warranty covers this. It would have been covered a year earlier. This is my fifth Toyota and the first problem I have had with a Toyota. I consider this an engineering problem and I am extremely upset about it costing me $1200. I bet it will happen again at 76,000. Update from Jan 16, 2011: I took the 2007 Rav 4 to Midas, The final cost was $471,71 as Midas cut the tailpipe after the catalytic converter and used an after market muffler, I also have a lifetime guarantee if it happens in another 38,000 miles. Update from Jan 16, 2011: I took the 2007 Rav 4 to Midas, The final cost was $471.71 as Midas cut the tailpipe after the catalytic converter and used an after market muffler, I also have a lifetime guarantee if it happens in another 38,000 miles.